This post is sponsored by Omegease. We are being compensated to help spread the word about Omegease, but Pawsitively Pets only shares information we feel is relevant to our readers. All thoughts and opinions expressed here are our own. Regardless of what your dog or cat eats as their main diet, it's nice to know you can give them an extra boost with something as simple as a daily fish oil supplement. Shiner and Callie currently eat a commercial dry and wet food diet, so I do like to give their food a boost with fish oil. Even pets who eat raw diets sometimes need supplements to make sure they are getting everything they need with their food. In the past, I tried a joint supplement for dogs with Shiner called Rejenease. 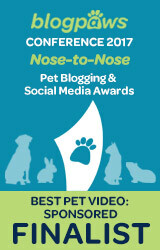 Today, I am talking about their new fish oil product - Omegease Omega-Rich Fish Oil for Dogs & Cats. Shiner and Callie have been taking this fish oil for several weeks now and I'm pleased with the results. I like giving Omegease to Shiner to keep her joints healthy because of her senior status. She really shows no signs of arthritis and I'd like to keep it that way. Also, Shiner has itchy skin from time to time. It seems to be seasonal most of the time, but we haven't experienced any problems with itchy skin while she's been on Omegease. Callie the cat is also older at age 9, but she has no health issues. I like that Omegease will help to boost her immune system so that she can stay healthy. Since I've been adding Omegease to her food, her coat is looking beautiful and shiny. Adding Omegease to my pets' food is simple. It comes in a bottle with a pump for easy administration. The directions and dosages are easy to understand. Shiner gets 1.5 pumps a day and Callie gets 1/3 pump a day. Neither of them seem to have an issue eating the fish oil with their food. 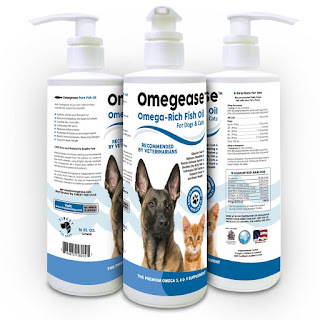 Omegease Omega-Rich Fish Oil for Dogs and Cats is a 100% pure and natural product for pets. Made with wild Sardines, Herring, Mackerel, and Anchovies that are caught from the North Atlantic using Dolphin-friendly methods. It's distilled at low temperatures to preserve its potency. It is a human grade product and veterinarian recommended. Omegease is a good value too. Apparently, one 16 oz. bottle of Omegease can last a 50 pound dog 90 days for less than 25 cents a day. Trying Omegease is risk-free. If after 30 days of using this product, you aren't happy with the results they will refund your money. Omegease is available for purchase on Amazon. Just click here to purchase some for your dog or cat. You can save 25% on your order of Omegease, Rejenease, or both products together in one order by using the special code PAWS2016 at checkout. This code is good for a single use and is valid until December 31st, 2016. You can also download Omegease's FREE e-book called "50 Tips to Help Your Dog to Walk, Run, and Play Like They Use To". The book is a wonderful resource that is meant to share helpful advice on how to care for a dog with hip and joint mobility issues. Click here to download a copy. Want to get your paws on a bottle of Omegease Omega-Rich Fish Oil for Dogs and Cats? We have a giveaway! 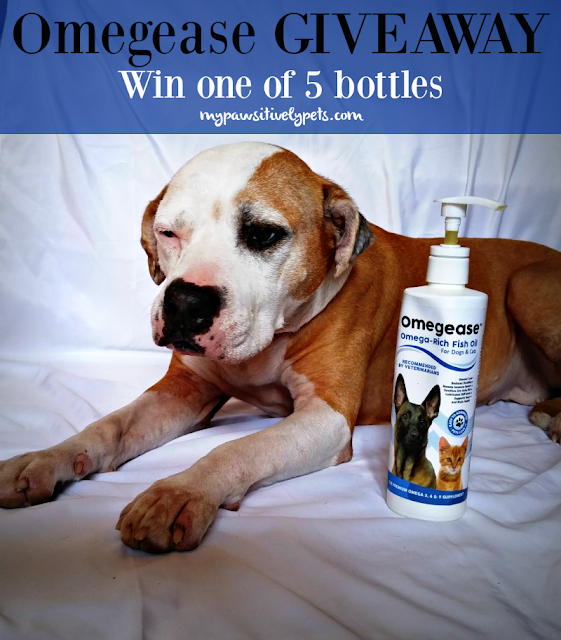 We are giving away 5 bottles of Omegease to 5 different readers. This giveaway is open to US residents only (void where prohibited by law), ages 18+. This giveaway ends on October 28th, 2015 at midnight CT.
To enter, just fill out the Rafflecopter form below with as many entry options as you like. The more entries you complete, the more chances you have at winning. However, all of the entry options are not mandatory to be entered. Good luck! Great review! I just ordered a bottle and will be using it with Jeffie. Looking forward to good results. Awesome - hope you and Jeffie enjoy! Haven't heard of this stuff, but we do love Fish Oil!! My dogs have never tried fish oil. I would love to try it for them. I would like to try this to help my dog with her itchy skin and shedding! I entered as "Amie De" through Facebook. Maybe I won't have to try to get the vitamin e capsules the human drops on the floor if I get this stuff! My dogs love the flavor and it is so good for them! Very fun! We love stuff like this!! You should come enter our jerky giveaway too! Awesome product. My sisters and I all take it with our food too. The cats could I guess, but for now just us dogs have it on our food. I thought I might as well try it with the cat. She doesn't seem to mind. i give my girls omega3 now that i get from the vet, but am always looking for new products to try, my oldest really needs this for her arthritis and joints as well as brain since she is almost 14. i also give them sardines in water on top of their kibble....they love sardines. I make my cats food and add fish oil to it but I have to dissolve the gel caps in water so this would be much easier! thanks! I take fish oil myself, and I know how much better it makes me feel. I'd love to give the same advantage to my dogs. I live in high desert country & dry itchy skin is a problem, one of my dogs is always rubbing on the furniture & wears her fur off, even when I treat here with naturalpathic oils & moisturizer. I'm already using another brand called Grizzly at the moment but would be willing to try another brand if it's better. One of my dogs also suffers from itchy skin and Seborrhea including Ringworm so it's a must that he gets his omega 3's. 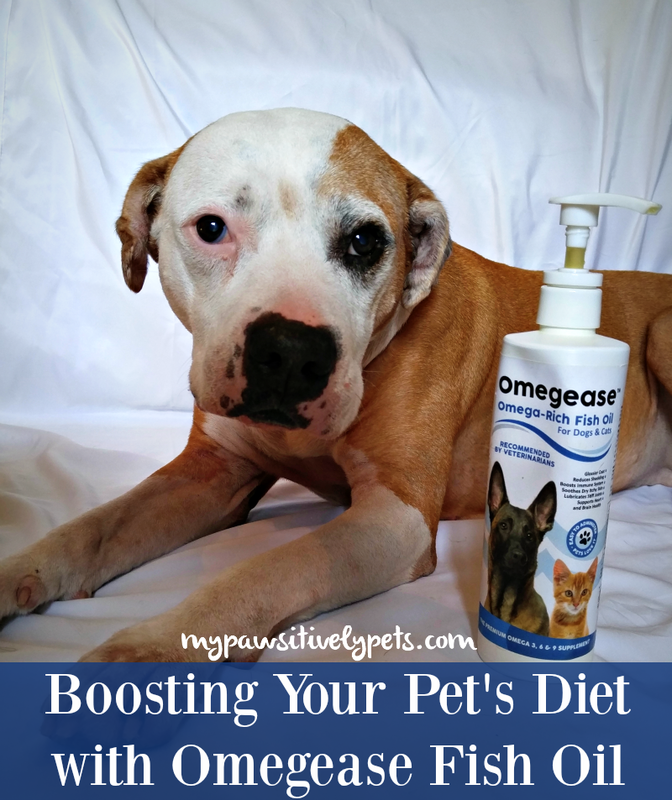 I would love to try Omegease Fish oil because its been a while since I used fish oil and I am always looking for something to help my dogs itchy skin. I would like to win this prize because my kitty-boy is getting on in years and I would like to keep him feeling great as long as possible! TW thinks I’m getting old and should start taking supplements. I’m not; I’m jsut getting better. 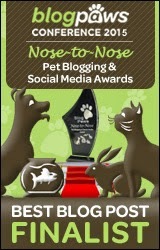 I would love to win this for my fur baby. She is starting to have joint issues and I want to improve her health. We have used Omegease too and were happy with the product. I like that it is free of mercury and other toxins, unlike some of the other products out there. Our vet recommended I start my dog Ace on a high-quality fish oil so this is the brand we are trying. I am sure whoever wins will also benefit! I always give my dog some fish oil in here dinner but I have never tried this brand! Excited for this great giveaway! I love that it's a human grade product :) I would love to try this with my dogs because of all the health benefits. Ruby has a grain allergy which causes her to have skin allergies. She currently takes Benadryl and coconut oil to help keep fur on her. 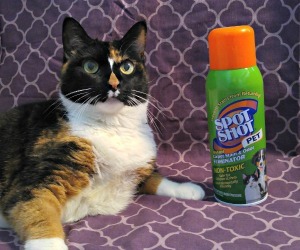 I would love if there was something else that could help her skin and coat too. The beast is getting older, just like us, and I want her to feel her best! I have a dog, two cats, and three ferrets, I know this could be beneficial to all them. My dogs have never tried fish oil. I like to try to do as much as I can for my dogs now while their joints are healthy. I want to give this to my 10 year old dog so he can keep going strong. This looks great, I am going to try this out with Giles!